Deneen Borelli, age 54, has a marriage to treasure. Blessed with a loving husband and adorable children, the FOX news contributor is enjoying marital bliss. What's more, the political analyst is aging like a vintage wine, the older, the better. The Connecticut-native is the chief contributor of the Conservative Review, a pro rightist media company founded by political commentator Mark Levin. The political columnist is also known for her best selling political critique of Obama administration 'Blacklash: How Obama And The Left Are Driving Americans To The Government Plantation' (2012). 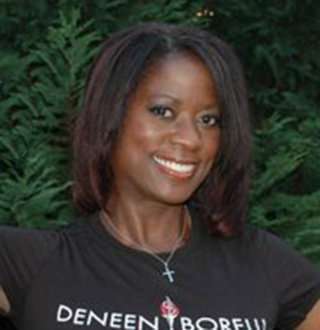 Deneen Borelli's one of the few conservative voices among the minorities and thus was chosen to lead the outreach of FreedomWorks, a conservative advocacy group, into the minority communities. Born on 24 May 1964 as Deneen Laverne Moore, at Connecticut, she began her career as a secretary with American tobacco company Philip Morris. Working full time with the company, she had to attend classes at night, and it took her 11 years to graduate in Managerial Marketing from Pace University. After a long stint at Philip Morris where she served under various ranks, she worked as a media manager at Congress of Racial Equality (CORE). Her media career started with the CORE as co-host and producer of weekly internet talk show; The CORE Hour. The TV persona as of 2018 works as a contributor to Fox News, providing political insights in various shows like Hannity, The O’Reilly Factor, Fox and Friends, and Your World with Neil Cavuto. She is also a frequent guest at Fox business' shows and Glen Beck's online show GBTV. Not just that she is also a regular columnist for the most prominent newspapers including Los Angeles Times, Philadelphia Inquirer, Chicago Tribune, where she discusses the current political scenarios and anticipated changes in the political field. One of the most famous and outspoken conservative supporter, Deneen's 2012 best selling book was aimed at the leadership failures of the Obama administration and remains one of the finest political analysis of the Obama's presidential term. She is also a regular speaker at political rallies and tea party rallies, and her presence alone is a significant drawing factor to the audience. Since she is a rare conservative among the minorities, she is oftentimes condemned by people of her own community. Especially because she condemns President Obama, who was very popular among the African American community. Recently, she condemned Baltimore city administration for wasting their money "to help immigrants fight deportation" instead of using that to better its condition, which is worsening day by day. Apparently, Baltimore city administration, in its policy of helping immigrants, was in open defiance to the president of the country. And as a conservative analyst, Deneen outpoured in a scathing manner, and that didn't go well with many African-Americans. Some went as far as to accuse her of supporting "a racist who hates you". The conservative hardliner is a big softie outside her avatar of political commentator and is happily married to Italian molecular biologist turned political activist Tom Borelli. The couple, who have been married for 12 years, share four children from their time together. Deneen is also close to her father and never misses a chance to be by his side whenever time permits. The black conservative woman was married to soft-spoken and white molecular biologist Tom Borelli in December 2006 at the ripe age of 42. Despite the couple's advancing age, the romance between them has not been lost and have four children together from their union. What's more, Deneen regularly posts about her husband in her Twitter, and the couple is always together whether that be celebrating their anniversary or celebrating their family members 'birthday. Similarly, both husband and wife being radio personality hosted SiriusXM's Patriot 125's Patriot on 28 June 2017, with the loved-up couple discussing the marital perks along with more serious topics. The husband and wife's chemistry was evident during the 3-hour phone-in show, and the love between the two had remained undiluted. The Connecticut native is, however, protective of her children and has not disclosed their identity in fear of being victimized by her political stances. And when Ivanka Trump, the daughter of Donald Trump is garnering furor and backlash for her father's deeds, maintaining privacy about her personal life is only right.